Mrs. Cheveley chides Robert in this 2-3 minute comedic monologue from Oscar Wilde's play, An Ideal Husband. INT: THE OCTAGON ROOM AT SIR ROBERT CHILTERN'S HOUSE IN GROSVENOR SQUARE. 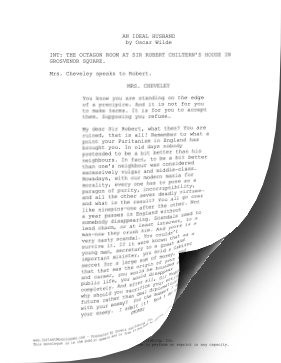 Mrs. Cheveley speaks to Robert. My dear Sir Robert, what then? You are ruined, that is all! Remember to what a point your Puritanism in England has brought you. In old days nobody pretended to be a bit better than his neighbours. In fact, to be a bit better than one's neighbour was considered excessively vulgar and middle-class. Nowadays, with our modern mania for morality, every one has to pose as a paragon of purity, incorruptibility, and all the other seven deadly virtues-and what is the result? You all go over like ninepins-one after the other. Not a year passes in England without somebody disappearing. Scandals used to lend charm, or at least interest, to a man-now they crush him. And yours is a very nasty scandal. You couldn't survive it. If it were known that as a young man, secretary to a great and important minister, you sold a Cabinet secret for a large sum of money, and that that was the origin of your wealth and career, you would be hounded out of public life, you would disappear completely. And after all, Sir Robert, why should you sacrifice your entire future rather than deal diplomatically with your enemy? For the moment I am your enemy. I admit it! And I am much stronger than you are. The big battalions are on my side. You have a splendid position, but it is your splendid position that makes you so vulnerable. You can't defend it! And I am in attack. Of course I have not talked morality to you. You must admit in fairness that I have spared you that. Years ago you did a clever, unscrupulous thing; it turned out a great success. You owe to it your fortune and position. And now you have got to pay for it. Sooner or later we have all to pay for what we do. You have to pay now. Before I leave you tonight, you have got to promise me to suppress your report, and to speak in the House in favour of this scheme.